Add one more notch on Brantford, Ontario’s belt. The city is the birthplace of Wayne Gretzky and Phil Hartman, and it is where Alexander Graham Bell invented the telephone. It also houses the six members of the rising Indie/Rock band Racoon Wedding. Racoon can be spelled with one C or two. I thought I’d obviate the spelling lesson. Racoon Wedding is the music equivalent of what I would expect a raccoon wedding to be like: electric eccentricity, amicable drunkenness, poppy humor, and, most importantly, horn-fueled raccoon love. So, yeah, that odd comparison holds true for the sextet from telephone city. Come tomorrow with the release of the new LP, Racoon Dead on the Side of the Road, the band will have successfully depicted the joy of raccoon passion and friendship (which the name of the band implies) and the harsh inevitability of death at the hand of a metal box traveling at speeds no raccoon can match. Who knew that they were a concept band? All kidding aside, I’ve grown attached to the bluesy, Dr. Dog/Kay Kay and the Weathered Underground quirkiness and musical whimsicality of Racoon Wedding. With some bands (and I could feel this prior to watching the buddy/buddy bacchanal video below), you just know that friends are making music. And not like friends until some success presents itself and then “I’m going solo” becomes an overplayed comment. Friends who are friends who happen to make good music and have fun doing it. This comes through in the tunes, and it is one heck of a positive with Racoon Wedding. The band is haphazardly touring throughout Ontario, but I do hope this post helps give them some more play in the States. Fraternal harmonies, New Orleans horns, and pop rhythms, when mixed effectively tend to engender popularity, and I predict good things for Racoon Wedding in the future. 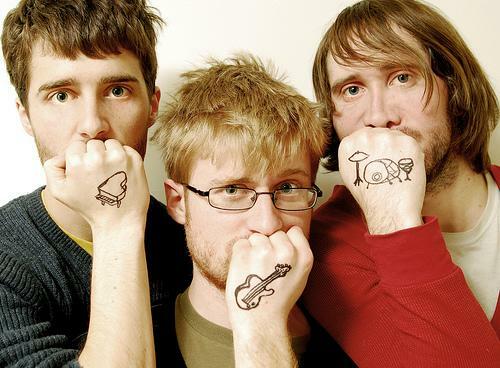 Jukebox the Ghost will not create an uncatchy song. It’s just not in their poppy nature. The Philadelphia-based band who met while attending school at George Washington University, has succeeded in creating indie/pop music that is far from corny. No, the well-read trio blends effervescent hooks and wonderful melodies. Lead vocalist and pianist Ben Thornewill has a magnetic voice and can just flat-out riff on the piano. Tommy Siegel (vocals & guitar) and Jesse Kristin (drums) carry the rest of the rhythm, Siegel providing some neat guitar licks and efficient back-up vocals. The band has been rocking since 2006 and show no signs of stopping. How do I know? Well, their new album Safe Travels is coming out June 12. I’ve written about Jukebox before in a post featuring what I coined at the time “Anthemic Indie” and I do think they still fit in that category if only because their music is so easily singable and it is hard to resist singing out the tunes with them. You can check out that post here. “Somebody,” a single off of the new album, is now available on iTunes and you can access it by checking out Jukebox’s site here. Let’s take a listen. The song begins like a slowed down Fitz and the Tantrums piece – kind of rhythmic Motown meets funky indie. Thornewill and Siegel immediately embark on a succesful harmony during the verse which is carried by Kristin’s beat. The chorus takes on its own mold. Originally I thought I could compare it to Ben Folds, but I’m starting to think that the vocal swoons and unique rhythms are just Jukebox the Ghost. The best comparison is the band itself. In six years the band has certainly developed their own sound and it is easy to recognize their brand of pop. The song moves (with some more guitar stylings) and the catchy chorus that sticks. If the rest of the album plays like “Somebody” we will be in for a good one. There is no reason to doubt it.